DSP based Communication systems, Wireless Communication Systems, UWB Systems, Communication Networks, Antennas, Microwave Engg. The main focus of the research in communication and advance DSP has been on the performance analysis of modern communication systems as well as development of signal processing algorithms for the same. The research in communication involves realization of both the transmitter and receiver diversity techniques with various channel models. The statistical characteristics of mobile-to-mobile communication channel and geometrical based modeling of such channels are being investigated. The latest channel coding techniques such as the LDPC and Turbo codes have also been taken up for the performance analysis in appropriate areas. The DSP related research includes developing link performance improvement algorithms such as those for equalization, diversity and networking. A number of non-blind and blind equalization techniques are developed for this purpose. Cross layer optimization between PHY and MAC layers for MIMO systems is another thrust area of the group. The group is initiating its next major research activities on ultra wideband (UWB) communication systems. Research activities have also been started in the area of Wireless Sensor Network and IPv6. The hardware facilities consists of Vector Network Analyser (6 GHz), Spectrum Analyzer (1.8 GHz), Synthesized RF Generators, Digital Storage Oscilloscopes (150-500 MHz), Mixed signal Oscilloscopes (100 MHz), Logic Analyzers (16 & 34+ channels), Arbitrary Waveform generators (80 MHz), Pulse generators (150 MHz), Bench-Top DMM (6.5 Digit), Timer/ Counters (10 Digits, 5 GHz), Programmable Power Supplies, LCR Meters, Digital Modulation Signal Generators etc. 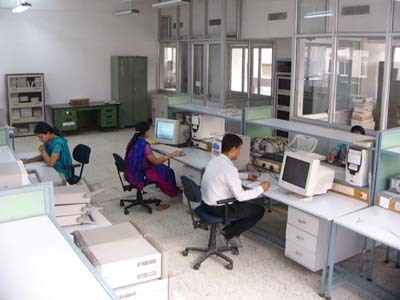 Some of the available software are Matlab 7.3, IE3D Electromagnetic Simulation Software, Analog Device’s Crosscore Visual DSP++, Texas Instruments Code Composer Studio, Hypersignal Graphical DSP development software, Elanix SystemView, Agilent VEE Pro, Tektronix’s Wavstar, Cadstar for PCB Design etc.